We live in a moment of profound transitions caused by the accelerating dynamics of planetary change. The digital transformation is an important driver of this dynamics which we need to better understand. Max Planck Institute for the History of Science, Boltzmann Str. 22, 14195 Berlin, Germany. Max Planck Institute for Chemical Energy Conversion, Stiftstr. 34–36, 45470 Mülheim an der Rühr, Germany. Human actions have attained dimensions comparable to the natural processes in the Earth system and will have long-lasting biophysical effects of geo-historical significance. These changes are increasingly interpreted as signs that we have entered a new geological era: the Anthropocene. Accelerated rates of change in our highly technological and knowledge-driven societies are directly tied to human-led developments. The rapid advancements in science and engineering, in the energy system and in labour markets, the dramatic shifts in the global economy and also political economy – but also the direct impact of new forms of regulation and international law – are increasingly affecting the metabolic functions of natural habitats globally. A highly potent but often neglected component in this system-wide incursion is the digital transformation. Digital technologies mark not only a thorough shift in the socioeconomic and cultural realm but also occupy a crucial role in first entering and now inhabiting the Anthropocene. As both a trigger and an indicator of rapid shifts in the global economy, resource and energy flows, and the management of complex societal demands and forces, digitalization is central to understanding the gravity of our current historical moment and a pivot through which control over the most dangerous pathways ahead can be lost or gained. 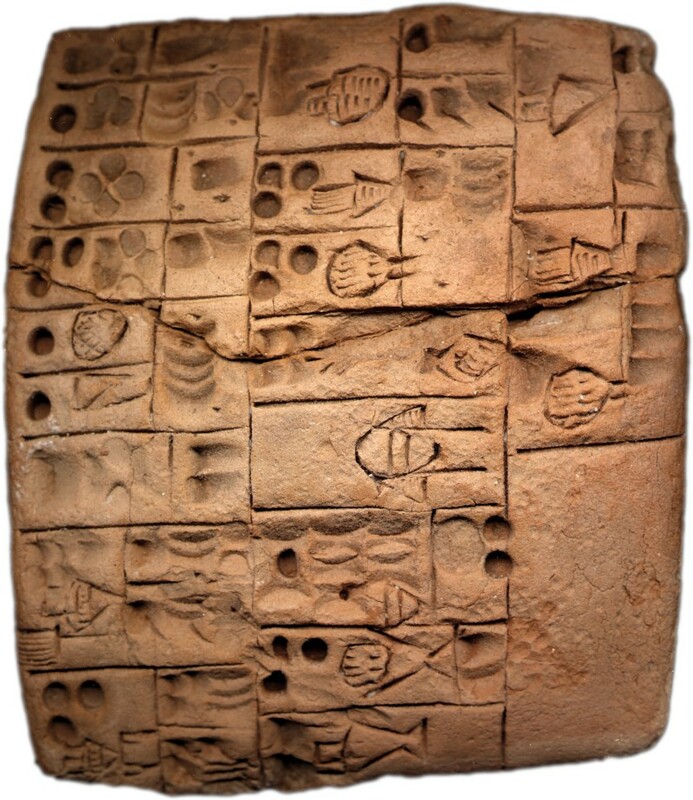 Figure 1: Clay tablet showing ancient calculation and accounting practices (ca.3200–3000 BCE). (Erlenmeyer collection Berlin). A new, integrative form of basic science should provide guidance in the multi-scale phenomena mentioned above and should further provide the tools to develop suitable action intending to control the effects of these developments. The integrative approach seems feasible, not least because the digital turn has already had multiple effects on the way science is done (science is subjected to it, it tries to understand it and it contributes to shaping it). As far as the current understanding of the impact of the digital transformation is concerned, we are at about the same level of knowledge that climate research was at 30 years ago, at the beginning of Earth system research and the appearance of climate as a subject of global politics. To study the increasing lock-in between the natural spheres and a ‘technosphere’1 densely populated with digital devices, we need new forms of joint human–Earth system research that focuses on the co-evolution and internal dynamics of the interactions between both domains. Moreover, such research is only comprehensive when open dialogue with society is included, in which one can reflect, discuss and shape the power of digital instruments in a collective way. As a way of introduction into such an endeavour, this article outlines aspects that highlight how digital technologies operate as effective mediators in the ongoing transition into the Anthropocene and give historical insights into how they have attained the role as an accidental but highly consequential megastructure2. Information has asymmetric effects. Letters and numbers are an almost weightless media, but they provide a means to organize states, move legions and run economies. Since the earliest examples of literacy and calculation, information has given shape to land use and urbanization processes, production cycles and long-distance transportation. From cuneiform tablets in Mesopotamia (Fig. 1), papyrus in the Roman Empire and medieval codices to modern typesetting, telegraph signals in submarine cables or the time-critical data infrastructure created in the wake of automated finance, information media offer ever more discrete ways of signalling and mobilizing ever greater societal and material systems. The impact of information technologies on societies and physical environments is thus not limited to modern times. Yet, today’s state of the asymmetry between coded information and its physical effects is epitomized by electrons passing through digital microprocessors that effectively steer material and energetic flows within a technosphere spanning the globe from satellite orbits 40,000km above the Earth’s surface to 10km into the lithosphere. Such proliferation has effects. 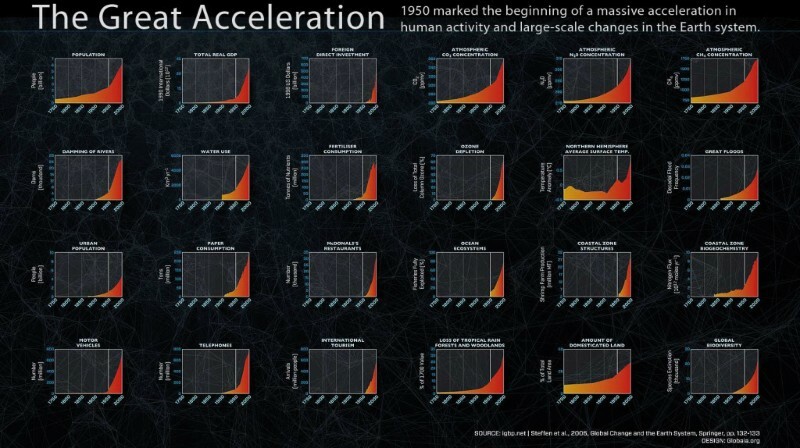 Concurrent with the rise and spread of digital technologies is the ‘Great Acceleration’3, the exponential increase of key indicators of socio-economic and Earth system trends since around 1950 (Fig. 2). In the second half of the 1940s a four-part revolution took place in information theory (Claude Shannon), logical computer design (John von Neumann), semiconductor physics (William B. Shockley and Walter H. Brattain), and the establishment of a new, integrative science called cybernetics (Norbert Wiener). This revolution not only created the technical basis of today’s digital world but also joined forces with the parallel transformation of wartime economies into civilian consumer societies, an Anglo–American-led transition from coal to oil supply, and a steep increase in key socio-economic indicators such as primary energy use, gross domestic product, fertilizer consumption and population growth. The computer revolution coincided with the inflection point of the Great Acceleration around 1950, which, as it happens, is also considered as the beginning of the Anthropocene as such. The Anthropocene Working Group of the International Committee on Stratigraphy, which is tasked with identifying a globally synchronous marker to define the stratigraphic base of the ‘age of humankind’, is considering the ‘plutonium spike’ as a primary candidate. The plutonium spike is a marked radionuclide layer found in sediments and ice cores across the globe that resulted from the frenetic activity of nuclear testing that began in 1945 and peaked in 1962. Early computers were instrumental in the development of the nuclear bomb. The challenge presented to the scientists in Los Alamos – the secret second world war site at which the atomic bomb was designed under the supervision of Robert Oppenheimer – was to accurately simulate fission reactions, an impossible task without computing aids (Fig. 3). 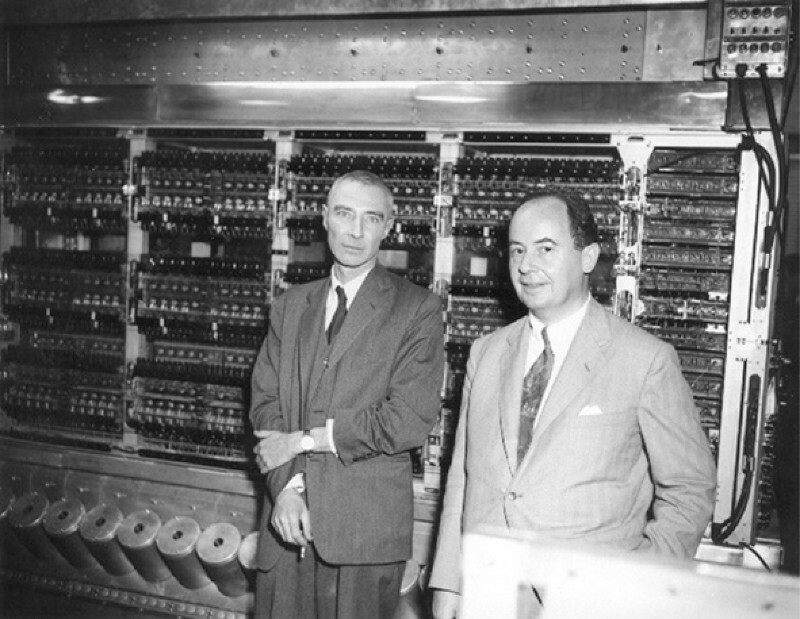 While analogue, punch-card styled computers were still used to calculate the vast numbers of differential equations for constructing the atom bomb, the work at Los Alamos was instrumental in spurring the development of electronic digital computers, with much owed to the theoretical efforts of John von Neumann. In late 1945, the first ever problem to be run on the newly designed Electronic Numerical Integrator and Computer (ENIAC) was a critical calculation for the development of the hydrogen bomb. The massive worldwide testing of this thermonuclear weapon since 1952 is the main cause of the plutonium spike signal that can be detected in the globally distributed strata. The scenario planning for the cold war that followed was again much based on Monte Carlo simulations, with large random number sets being run on electronic computers to guide probability-based decision-making in the face of a nuclear standoff between the East and the West. In short, the nuclear age – likely the most prominent hallmark of twentieth-century technological culture and now considered to be the stratigraphic starting point of the Anthropocene – was directly tied to the start and rise of the digital age. The prominent nuclear signal in the novel strata appears also as a material effect of computational power. In current historical research, such chronological and material correlations are still largely obscured. A recent book outlining the Great Acceleration does not even mention the digital transformation4. Future research must, therefore, look at the mutual penetration and reinforcement of expanding information technologies and the equally expanding rates of production and consumption. The exponential rise in the connectivity of telecommunications since the 1950s, as depicted in one of the graphs of the Great Acceleration, is just one of many such indicators. The first digital computers began to significantly augment human capabilities by helping with knowledge management in military and engineering contexts, as well as public administration, economics, resource exploration, industry, and, of great consequence, the natural and social sciences. Artificial intelligence is not a new concept but was introduced in the mid-1950s to extend the possibilities of representing and processing knowledge with machines. Many of the early technocratic dreams of cybernetic, self-governing processes within society have not been fulfilled. But with the rise of computer networks – most notably the design of the Advanced Research Projects Agency Network (ARPANET) and basic Internet technologies such as packet switching and the Transmission Control Protocol/Internet Protocol (TCP/IP) protocol – a new form of data-intensive networked intelligence has materialized today. Information that is almost instantaneously shared globally through digital networks has contributed to a dramatic acceleration in all processes within the market-based economy. Markets have always been predicated on the possession and exchange of information about goods and the condition of their availability. But with the introduction of digital technologies and the ubiquitous status they have attained, information has become the basic unit of the global economy. Moreover, this economy is now increasingly synonymous with the unlocking, transforming, storing, distributing and processing of data, as can be witnessed by the rise of data capitalism. The nature and structures of these transformative and accelerating mechanisms and their direct impact on Earth system capacity requires highly integrative research efforts. The digital transformation of the world economy goes beyond the obvious cases of financialization, the high-frequency trading of stocks and derivatives, and digital currency transactions. 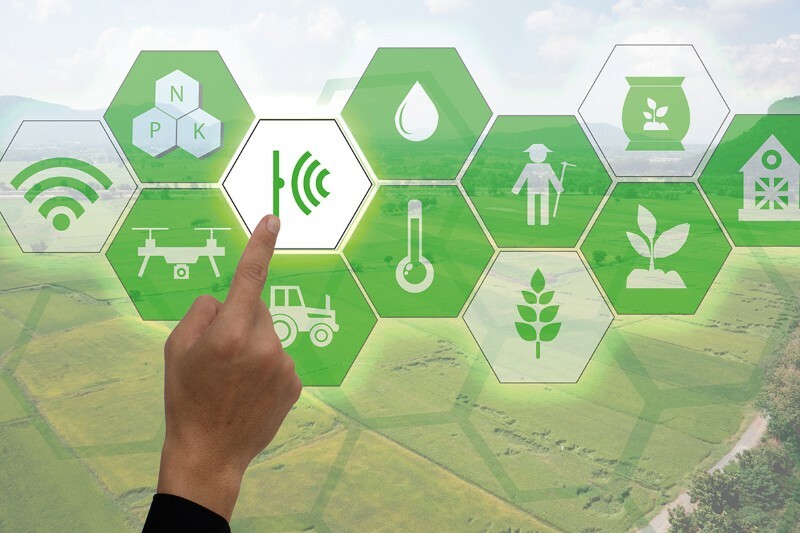 Digital tools and means of communication also profoundly affect the real world of agricultural and industrial production, the global circulation of goods, people and biomass, while also helping to inform macro-economic planning and political decision-making. The one factor that unifies these activities besides their appetite for aggregated information is energy and resources. The resulting effect of this coupling is that a digitalized economy also accelerates the fossil economy. Means to automate production and distribution, or to synchronize industrial flows and to fulfil on-demand/on-time production, to outsource labour, or to form a planetary labour market for digital micro tasks5, do not just simply increase the efficiency with which demand is met. Often overlooked is the effect that any efficiency gained in a process is likely to lead to the production of even more goods and services. This, again, directly translates to consumption of raw materials, products and energy. More, faster, higher – that is the promise and also the delivery of digital network technologies. A good deal of this acceleration is autocatalytic. The digitalization of the real economy (‘industry 4.0’) creates an exponential rate of new interfaces between digital and real agents. The resulting complexity can only be dealt with using new digital instruments that tend to contribute to new interfaces. An example for this autocatalysis is the growth of business administration infrastructure. The term ‘effectiveness’ becomes related to the unit of analysis; the more systemic one interprets effectiveness the more questionable is the gain of effects for the benefit of the system. Today it is clear that the continually increasing effectiveness of this acceleration has created a significant shift in economic value creation and capital accumulation. The biggest companies in stock value today are technology companies such as Apple, Amazon or Alphabet. Those few captains of industry have created smart monopolies that increasingly dominate the distribution of wealth. Their innovation is to spearhead variations of platforms for the exchange and ownership of all sorts of data, setting off a novel value chain that imperils the long-stable vocabulary of political economy and its focus on human labour, commodity or utility based value systems6. While the rise of platform capitalism has forged a symbiosis between online and offline as a business model, the implementation of networked technologies such as radio-frequency identification (RFID) and the Internet of Things addresses information infrastructure from its physical end. The Internet of Things envisages a global infrastructure in which physical objects are coupled with embedded ubiquitous computing facilities and virtual representations within an electronic network, allowing for new forms of intelligent interaction between these objects. Ten years ago we had already reached a point at which machine connectivity to the Internet outnumbered human connectivity7. Today, we are looking at about 25 billion connected devices and the number is growing exponentially8. The physical world, increasingly populated and penetrated by smart objects, turns into an exponentially expanding address space for computerized networks, so much so that it is argued that we have reached a planetary scale of computation. According to the media and design theorist Benjamin H. Bratton, the Earth is just the outermost layer within ‘The Stack’, a totalising system of information-processing architecture that extends from bit to globe. Digital technologies do not only provide the basic infrastructure to control the industrial metabolism, they also are first-rate consumers of resources. Through the entwinement of the digital sphere with the physical world and actual energy and material cycles, digital communication has become tightly coupled to the current dynamics of wear and tear of earthly resources. No computational infrastructure can exist without the prior transformation of matter and no information without the transformation of energy. The asymmetry of signals and effects should therefore not be misinterpreted. Information technology is the opposite of an immaterial technology. Even the smartest device needs dumb metals. At least 40 chemical elements are used in every smartphone, which means we carry around one-third of the periodic table in our pockets. What seems to be an almost immaterial business of zeros and ones makes use of more chemical elements than every previous technology in history. Such elements come with respective ‘stories of stuff’, which connect the ostensibly clean digital world to the dirty business of rare-earth extraction, rife with human and environmental exploitation. Given their criticality, some of these metals are produced in seemingly ridiculously small amounts: about 120 metric tons of germanium are produced per annum, and about 500 metric tons of indium, though this is no indicator of the amount of effort and ore required to produce such quantities. While we have reached a point at which functional materials such as indium may impose a bottleneck on further growth if consumption rates continue, there is also a staggering amount of physical electronic waste that results from the creation, maintenance and discarding of the micro-electronic components of macro infrastructures. The material residue of technological obsolescence, often toxic, marks the final stage of the life cycle of digital devices that contributes to the growing waste layer of the technosphere. Before they die, however, digital devices consume. The expanding digital economy requires a seemingly ever-growing expenditure of primary energy. Cloud computing, the Internet of Things, the operation of platforms and neural nets, all devices always switched on. The digital golem’s hunger for electric power is insatiable. A telling case is the current trend to transfer economical transactions to exchanges for cryptocurrencies and smart contracts. These transactions take place through blockchain software architectures that provide a highly decentralized, autonomous arbitration space between buyers and sellers. This requires immensely energy-intensive computation to ensure the validity of each transaction. To bring the above metaphor of appetite for energy into an interesting comparison it is worth noting that the current energy consumption of the Internet is comparable to the energy we invest in producing ammonia for fertilizers. Without their existence only half of the global population could be fed on our planet9. Human life and its foundation in the global environment is not primarily related to information and software but to the material world of biological, chemical and physical hardware and their interactions with the global material spheres in which we live. But both are increasingly tied to each other, co-dependent on massive energy infrastructures and market operations. Figure 4: Smart farming is just another example of the catenation of natural processes with digital technologies. Smart data technologies appear to many to offer ways out of the energy and resource dilemma. New accounting practices might improve attempts at sustainable resource allocation by reducing the resource intensity of production (Fig. 4), enabling self-provisioning use of renewable energy. As historian of infrastructure Paul Edwards writes: “[in] blending [the] social ‘data exhaust’ with physical and environmental information, an environmentally focused logistics might trim away excess energy and materials in production, find new ways to re-use or recycle waste, and generate new ideas for eliminating toxic byproducts, greenhouse gas emissions and other metabolites”10. However, in undertaking such endeavours, rebound effects should be a concern. As the well-known Jevons’ paradox states, increasing efficiency will likely lead to an increase in consumption in response to lower prices. One will have to see if smart, adjustable technologies create a difference to that rule. Moreover, knowledge infrastructures that run on digital technologies provide the necessary data and assessment of mitigating strategies to achieve notable successes in environmental and climate regulation. The Montreal Protocol that has effectively limited ozone depletion, or the Paris Agreement that will hopefully achieve the same for greenhouse gases in the long run, would have been unthinkable without the expert judgment of a global network of atmospheric data and climate modelling efforts. We would likely be unaware and unable to quantify global change if it were not for the metrological capacities of digital technology. Digital technologies are the backbone for monitoring and understanding the current dynamics of the Anthropocene. Global climate change (to just name one key example) can only be observed due to the availability of large quantities of data, adequate computing facilities and sophisticated modelling11. Essentially, the age of planetary communication is also the age of planetary observation and simulation or, as Jennifer Gabrys puts it, we are dealing with “becoming environmental of computation"12. Earth system models, satellites and other remote sensing networks, environmental data aggregators and resource flow models mean that technical media have become an obligatory passage point in perceiving, analysing and mobilizing geoscientific knowledge. More widely, this obligation not only concerns the collection and assessment of scientific data, but all kinds of digitally augmented knowledge, from social media-driven citizen science (as in the case of Instagram users sharing flotsam collages that help to trace maritime currents) to the imaginative knowledge drawn from the visual semantics of climate change in the digital charts and diagrams of the United Nations Intergovernmental Panel on Climate Change (IPCC)14. In the end, the digital turn affects the way we do science in myriad ways. Digitalization creates great opportunities because it fills a gap between observation, experimentation, modelling and theory. But this transfer to a new medium not only makes science more effective, it also affects its criteria, for instance, when it comes to issues of reproducibility, trustworthiness and causal explanations. Digitalization poses novel and challenging questions: Which tasks can intelligent machines handle better than humans? Where does human judgment play a part? How does machine-learning affect decision-making? How can machines best assist humans in their decisions? Where do biases creep in? What do optimal interfaces between human and artificial intelligence look like? Personal data available on the Internet opens up immense possibilities for misuse and manipulation, as the case of now-closed UK-based data analysis firm Cambridge Analytica demonstrated. The firm improperly gathered personal information from more than 80 million Facebook users with the aim of influencing the formation of political opinion. The primary aim of the contemporary economic forces currently driving digitalization is increased effectivity in the intelligent control of societal processes. The problem is that this control focuses on a few parameters of an attention economy, geared, for instance, to the time individuals spend on a Facebook page with the aim to maximize the efficacy of advertising. Data brokerage without safeguarding measures or the urge to superscore customers and citizens, as in the case of social credit systems, are an imminent threat to a free society. The further integration of ubiquitous computing technologies into the deep fabric of our societies may become immensely useful when adapting the global metabolism to the challenges of the Anthropocene. But it may also lead, through the value-chain logics of companies that own our data, or companies that own Internet of Things-ready networks, to a surveillance society of unprecedented reach. Such developments may even constitute a step in the direction of turning the digital sphere into a self-organizing intelligence with potential control over human behaviour, a powerful political weapon that invites dangerous misuse. We are left with a paradoxical situation. Digital technologies have greatly contributed to a frenzy of unsustainable resource exploitation and consumption (Fig. 5), the generation of waste and political ambivalence, yet they appear as viable solutions to ameliorate those problems. The rapid and radical change that has occurred to the Earth system as a result of the impacts of industrialized societies has been accompanied – if not leveraged – by rapid and radical changes in information technologies and digital media. Yet still, the hope is that their potential and collaborative scalability for a rational counter approach to untenable developments is enormous. 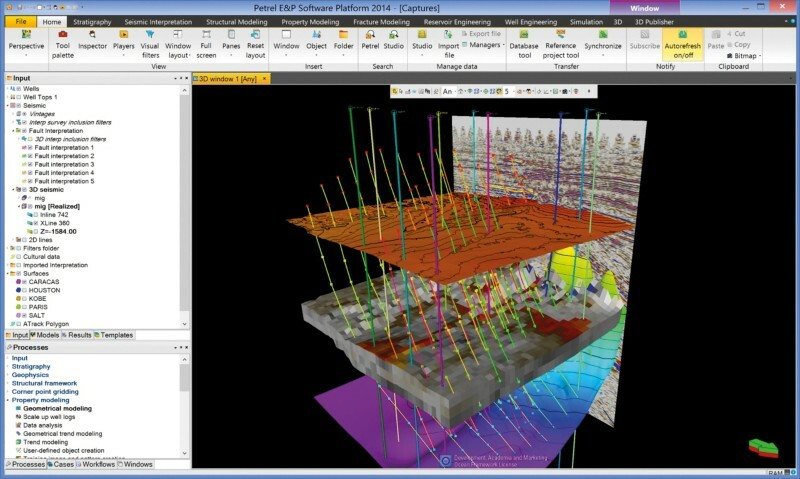 Figure 5: Sensing and interpreting seismic signals for the exploration of oil and gas has become a heavily computerized task. The next years and decades will see further dramatic shifts in technology and an economy driven by fast-paced technological innovation. Machine learning and neural nets are unleashing exponential increase in autonomous computational power. With further technological step changes – changing forms of labour, the design of novel materials, synthetic biology, new energy systems14 and new technological modes of controlling and managing the planet’s resources – industrial humanity will further deepen its imprint on the Earth and create further uncertainties and vulnerabilities for its safe inhabitation. As meatspace and cyberspace (terms introduced decades ago by the American-born novelist William Gibson) converge today, what we cannot lose sight of is Earthspace. We are obliged to treat the ‘critical zone’, the thin but highly complex layer of life extending from the lower atmosphere to the upper lithosphere, with duty and care. Yet, as scientists and humanists working in silos, we lack a shared language and method to grasp the interconnected and comprehensive character of the current threat to our life-supporting system. Like the Anthropocene, the digital blends such former distinct categories as the Earth, economy, culture and the social into one another. Our sciences, so far, do not. Novel forms of synoptic analysis, a new conceptual framework, new research tools and new research practices will be required to interpret and to help mitigate and steer the grand transformations underway. What is needed is independent research in a domain that is strongly shaped by technological developments and applied science, but also political and economic interests. Such research will have to overcome traditional borderlines, also between the natural sciences, the social sciences and the humanities. Many transversal connections between knowledge domains are needed to grasp the present situation and the interconnectedness of phenomena that we face. We want to call such research ‘geo-anthropology’, the science of human–Earth interaction. Geo-anthropology studies the various mechanisms, dynamics and pathways that have moved us into the Anthropocene. A key challenge of this framework for future research will be to address multiple scales of description, drawn from multiple forms of expertise, that help to shift between the analysis of specific micro-spheres and the planetary macro-sphere. Various temporalities, including deep-time perspectives, the history of the present and scenarios for the future, will have to be brought into productive contact with each other. The challenge is both to understand the systemic properties of the current transformation happening across many scales, but also to actively shape its future path as part of a broader dialogue with stakeholders in society, the arts, design, politics and industry. The Anthropocene calls for plurality of knowledge. Perspectives are opened up rather than reduced. The history of science and technology tells us that it is in these kinds of open spaces that critical and disruptive work can develop. Here and today it is for us to understand and possibly counter the critical features of a disruptive technology. A new Max Planck initiative concerned with geo-anthropology intends to contribute to this fundamental research. Rosol, C., Nelson, S. & Renn, J. Special Issue: Perspectives on the Technosphere (Parts I and II) Anthropocene Rev. 4:1 / 4:2 (2017). Bratton, B. H. The Stack: On Software and Sovereignty (MIT Press, 2016). Steffen, W., Broadgate, W., Deutsch, L., Gaffney, O. & Ludwig, C. Anthropocene Rev. 2, 81–98 (2015). McNeill, J.R. & Engelke, P. The Great Acceleration: An Environmental History of the Anthropocene since 1945 (Harvard University Press, 2014). Graham, M. The rise of the planetary labour market – and what it means for the future of work. NS Tech (January 29, 2018). Srnicek, N. Platform Capitalism (Polity Press, 2017). Evans, D. The Internet of Things – How the Next Evolution of the Internet Is Changing Everything. Cisco (2011). Lucero, M. IoT platforms: enabling the Internet of Things. IHS Technology (March, 2016). Smil, V. Enriching the Earth: Fritz Haber, Carl Bosch, and the Transformation of World Food Production (MIT Press, 2000). Edwards, P. N. Knowledge infrastructures for the Anthropocene. Anthropocene Rev. 4, 34–43 (2017). Edwards, P. N. A Vast Machine: Computer Models, Climate Data, and the Politics of Global Warming (MIT Press, 2010). Gabrys, J. Program Earth: Environmental Sensing Technology and the Making of a Computational Planet p. 4 (MIT Press, 2016). Schneider, B. The future face of the Earth: The visual semantics of the future in the climate change imagery of the IPCC, in Cultures of Prediction in Atmospheric and Climate Science (eds. Heymann, M., Gramelsberger, G. & Mahony, M.) Ch 13 (Routledge, 2017). Renn, J., Schlögl, R., Rosol,. & Steininger, B. A rapid transition of the world’s energy systems https://go.nature.com/2rzevps (2017).